It takes 243 Earth days to rotate once on its axis. The planet’s orbit around the Sun takes 225 Earth days, compared to the Earth’s 365. Also known as retrograde rotation. A possible reason might be a collision in the past with an asteroid or other object that caused the planet to alter its rotational path. It also differs from most other planets in our solar system by having no natural satellites. Early civilisations thought Venus was two different bodies, called Phosphorus and Hesperus by the Greeks, and Lucifer and Vesper by the Romans. This is because when its orbit around the Sun overtakes Earth’s orbit, it changes from being visible after sunset to being visible before sunrise. Mayan astronomers made detailed observations of Venus as early as 650 AD. In 2006, the Venus Express space shuttle was sent into orbit around Venus by the European Space Agency, and is sending back information about the planet. Originally planned to last five hundred Earth days, the mission has been extended several times. More than 1,000 volcanoes or volcanic centres larger than 20 km have been found on the surface of Venus. The dense clouds of sulphuric acid surrounding Venus make it impossible to view its surface from outside its atmosphere. It was only when radio mapping was developed in the 1960s that scientists were able to observe and measure the extreme temperatures and hostile environment. It is thought Venus did once have oceans but these evaporated as the planets temperature increased. Venus is a terrestrial planet and is sometimes called Earth's "sister planet" because of their similar size, mass, proximity to the Sun and bulk composition. It is radically different from Earth in other respects. It has the densest atmosphere of the four terrestrial planets, consisting of more than 96% carbon dioxide. The atmospheric pressure at the planet's surface is 92 times that of Earth's. With a mean surface temperature of 735 K (462 °C; 863 °F), Venus is by far the hottest planet in the Solar System, even though Mercury is closer to the Sun. Venus has no carbon cycle that puts carbon into rock, nor does it seem to have any organic life to absorb carbon in biomass. Venus is shrouded by an opaque layer of highly reflective clouds of sulfuric acid, preventing its surface from being seen from space in visible light. It may have possessed oceans in the past, but these would have vaporized as the temperature rose due to a runaway greenhouse effect. The water has most probably photodissociated, and, because of the lack of a planetary magnetic field, the free hydrogen has been swept into interplanetary space by the solar wind.Venus's surface is a dry desertscape interspersed with slab-like rocks and periodically refreshed by volcanism. The Venusian surface was a subject of speculation until some of its secrets were revealed by planetary science in the 20th century. It was finally mapped in detail by Project Magellan in 1990–91. The ground shows evidence of extensive volcanism, and the sulfur in the atmosphere may indicate there have been some recent eruptions. About 80% of the Venusian surface is covered by smooth, volcanic plains, consisting of 70% plains with wrinkle ridges and 10% smooth or lobate plains.Two highland "continents" make up the rest of its surface area, one lying in the planet's northern hemisphere and the other just south of the equator. The northern continent is called Ishtar Terra, after Ishtar, the Babylonian goddess of love, and is about the size of Australia. Maxwell Montes, the highest mountain on Venus, lies on Ishtar Terra. 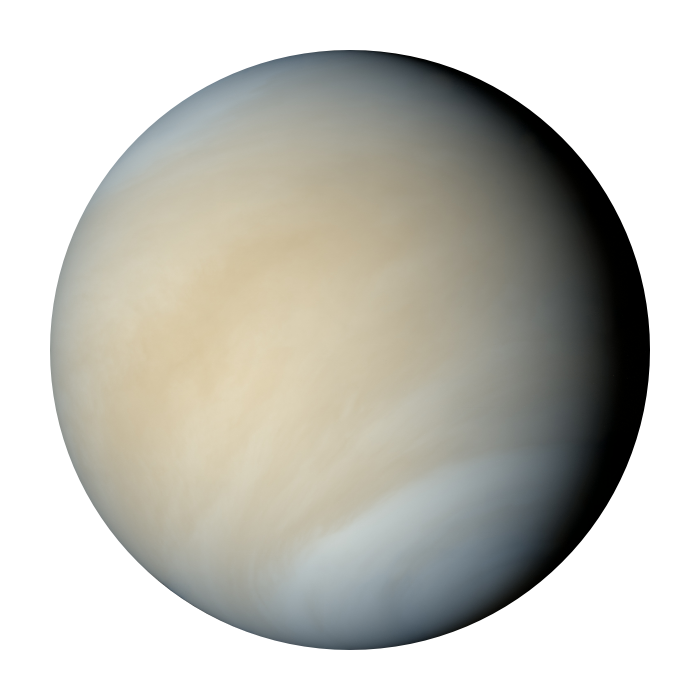 Its peak is 11 km above the Venusian average surface elevation. The southern continent is called Aphrodite Terra, after the Greek goddess of love, and is the larger of the two highland regions at roughly the size of South America. A network of fractures and faults covers much of this area. Much of the Venusian surface appears to have been shaped by volcanic activity. Venus has several times as many volcanoes as Earth, and it possesses 167 large volcanoes that are over 100 km across. The only volcanic complex of this size on Earth is the Big Island of Hawaii.This is not because Venus is more volcanically active than Earth, but because its crust is older. Earth's oceanic crust is continually recycled by subduction at the boundaries of tectonic plates, and has an average age of about 100 million years,whereas the Venusian surface is estimated to be 300–600 million years old. Several lines of evidence point to ongoing volcanic activity on Venus. During the Soviet Venera program, the Venera 11 and Venera 12 probes detected a constant stream of lightning, and Venera 12 recorded a powerful clap of thunder soon after it landed. The European Space Agency's Venus Express recorded abundant lightning in the high atmosphere.Although rainfall drives thunderstorms on Earth, there is no rainfall on the surface of Venus (though sulfuric acid rain falls in the upper atmosphere, then evaporates around 25 km above the surface). One possibility is that ash from a volcanic eruption was generating the lightning. Another piece of evidence comes from measurements of sulfur dioxide concentrations in the atmosphere, which dropped by a factor of 10 between 1978 and 1986. This may mean the levels had earlier been boosted by a large volcanic eruption. Almost a thousand impact craters on Venus are evenly distributed across its surface. On other cratered bodies, such as Earth and the Moon, craters show a range of states of degradation. On the Moon, degradation is caused by subsequent impacts, whereas on Earth it is caused by wind and rain erosion. On Venus, about 85% of the craters are in pristine condition. The number of craters, together with their well-preserved condition, indicates the planet underwent a global resurfacing event about 300–600 million years ago, followed by a decay in volcanism.Whereas Earth's crust is in continuous motion, Venus is thought to be unable to sustain such a process. Without plate tectonics to dissipate heat from its mantle, Venus instead undergoes a cyclical process in which mantle temperatures rise until they reach a critical level that weakens the crust. Then, over a period of about 100 million years, subduction occurs on an enormous scale, completely recycling the crust. In March 2014, the first direct evidence for ongoing volcanism was located, in the form of infrared "flashes" over the rift zone Ganiki Chasma, near the shield volcano Maat Mons. These flashes, ranging from 40 to 320 °C above the ambient, are believed to be either hot gases or lava released from volcanic eruptions. Venusian craters range from 3 km to 280 km in diameter. No craters are smaller than 3 km, because of the effects of the dense atmosphere on incoming objects. Objects with less than a certain kinetic energy are slowed down so much by the atmosphere that they do not create an impact crater Incoming projectiles less than 50 metres in diameter will fragment and burn up in the atmosphere before reaching the ground. Heute waren schon 33870 visitors (72196 hits) hier!